Imagine the perfect holiday - stress free days spent relaxing in the Mediterranean sunshine, enjoying breathtaking mountain scenery while residing, in five star comfort, in an enchanting sixteenth century villa. Imagine yourself a guest at Can Furiós, one of the finest country house hotels on the Balearic Islands; Majorca's best kept secret awaits you amidst the spectacular Sierra de Tramuntana, in the un-spoilt hamlet of Binibona. Situated in the north-west of the island, Can Furiós is an enchanting country retreat offering superb cuisine and accommodation of the highest standard. The original house, with its twin Moorish towers, has been sympathetically restored by local craftsmen to provide every modern luxury while retaining its traditional character. 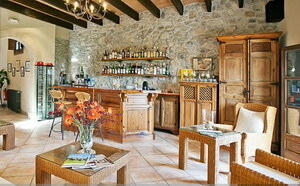 The hotel has a spacious private bar open exclusively to hotel residents. We are happy to provide itineraries tailored to your individual requirements, and can arrange activities to suit every taste, from walking and cycling to golf and water sports. We can also arrange car and boat hire allowing you to enjoy the sights and sounds of one of the most beautiful and historic islands in the Mediterranean. Offering personal attention in a relaxed and informal, atmosphere, Can Furiós is the ultimate place to leave your troubles behind, relax and unwind. Discover its pleasures for yourself, and enjoy an unforgettable holiday in one of the Mediterranean's most beautiful locations. 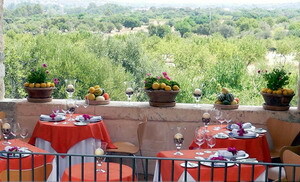 Our restaurant, Sa Tafoneta, has gained a reputation for excellent International and Mediterranean cuisine, and was recently voted as one of the top ten restaurants on the Island. Sa Tafoneta is open to both residents and non-residents so even if you are not enjoying the delights of staying at Can Furiós you can still enjoy dining in one of the finest restaurants in Mallorca. 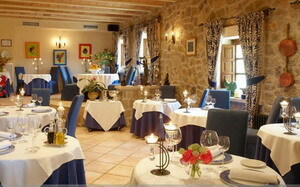 The restaurant is situated in the old olive press room (Tafona) which dates back to the 17th century. The main dining room is light, spacious and comfortable, and still features the original olive press. During the summer months our clients are able to dine on our beautiful exterior terrace and enjoy the warm Majorcan evenings. The dishes served in the restaurant are expertly prepared by the resident chef, with locally caught seafood a specialty. Only the freshest local produce is used in the preparation of our meals, which allows us to monitor the quality and only use the best ingredients. We fuse these sumptuous ingredients to create a range of mouth-watering meat, fish and vegetarian dishes that manage to capture the real essence of the Mediterranean. The restaurant has an extensive wine list that includes wines from all regions of Spain including many fine wines from Mallorca. 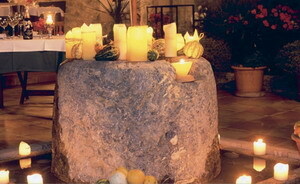 Sa Tafoneta is open to both hotel residents and non residents Tuesday to Sunday evenings, reservations are essential. 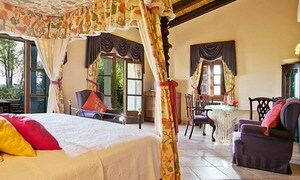 Can Furiós has seven spacious and beautifully decorated rooms. The four suites and three guest bedrooms, all with en-suite facilities are spacious and well appointed, all have air conditioning, central heating, satellite television, direct dial telephone and safety deposit boxes. The luxury accommodation has been tastefully furnished throughout in the local style, combining old world Spanish charm with a standard of service designed to meet the demands of the most discerning traveler. 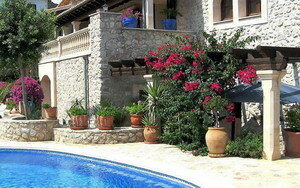 Guests enjoy exclusive use of the hotel's landscaped gardens and swimming pool. 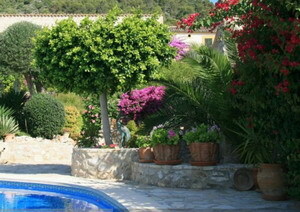 The undiscovered heartland of northern Majorca is the perfect location to enjoy a wonderful break. Here you can breathe the clean mountain air, scented with rosemary and jasmine plants, and enjoy the peace and tranquility of olive groves, where the only sound is the distant chiming of sheep bells. Can Furiós is a short drive from some of the island's most spectacular beaches and from fascinating mountain villages untouched by modern development. Should you wish to explore further, the colourful and historic city of Palma, is a mere 40 minutes by car. 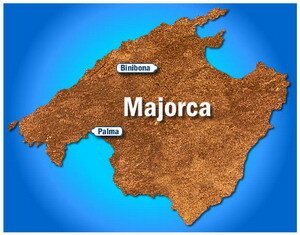 From Palma City take the PM-27 'autopista' (motorway) to Inca. When you come to a roundabout at the end of the PM-27 at Inca turn right. Follow the signs to Alcudia. At the third roundabout follow the pink signs to Selva and Lluc. You will go through the town of Inca arriving at a road junction, make a right turn towards Selva and Lluc. Follow the road to Selva. Just before the church in Moscari, turn left (sign posted Binibona). Follow the road directly towards the mountains and within 1 km you will see a fork in the road, follow the road to the right. Go straight over a crossroads directly towards the mountains and within 1km you will enter the tiny hamlet of Binibona. Can Furiós is directly in front of you as you enter the village. A limousine service is available from the airport. 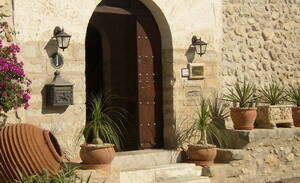 Prices are per room per night and include breakfast for 2 persons (maximum 2 persons per room). Continental breakfast is served daily between 8.30am and 10am (an additional 5 € is payable for a cooked breakfast). Check in time is after 1 pm, check out time 11 am. A 25% deposit will secure your reservation. The hotel is not suitable for children.